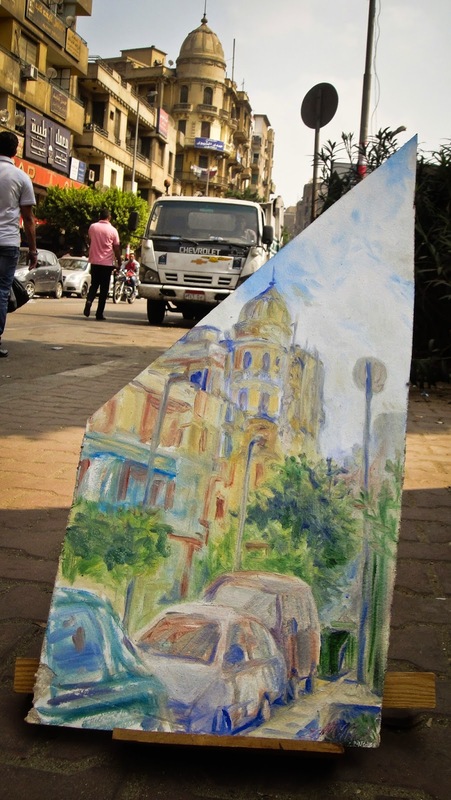 There's more Lost Art on the streets of Cairo this week! Unfortunately we've been offline for several days, so I didn't get a chance to post this until now. 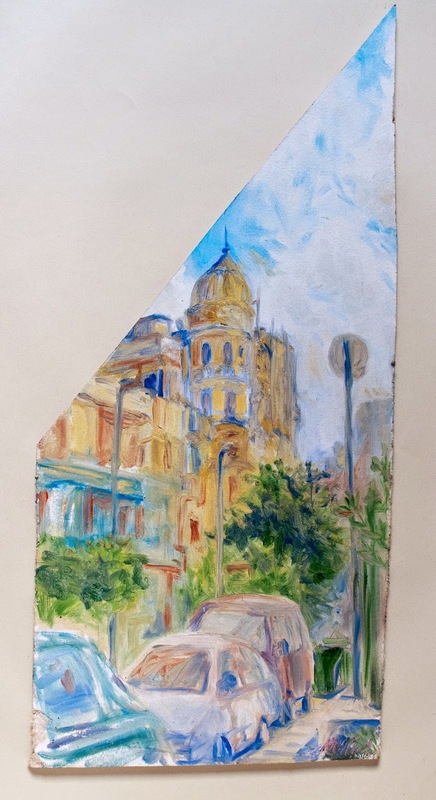 But I'm excited to have finally left a painting on the Midan Bab-el-Louq, which is a place where we have spent a lot of our time in Cairo. I had a very interesting time painting this one. There were lots of curious people who approached me to ask questions, but I didn't have an interpreter with me, so most of it I didn't understand. There was a nice painting teacher from a local art school who hung out with us for a while and did some translating. He was even nice enough to send a message in to the blog and say hello! I hope that maybe he, or one of the other nice people I met in this neighborhood, finds and enjoys the painting. At the very least, I hope that is not found and enjoyed by the creepy guy who works at the public toilet who tried to kiss me when I was getting up to leave. (You know who you are, creepy guy. If you found this painting, please don't enjoy it ;) ). But anyone else who finds it is more than welcome to do with it whatever they wish. And as always, please leave a comment and let me know if you found it! Now I'm off to scout new locations for my next few Cairo paintings. Still a month to go here! If you're in Cairo and want to suggest a neighborhood for me to paint in, please feel free to let me know in the comments. See you in the streets! This painting, oil on found wood, roughly 32.5 cm x 70 cm, was left at Midan Bab-el-Louq, Cairo on October 29th, 2014 at 2:30pm.